An upgraded lithium ion battery pack and electric motor have enabled the 2017 Volkswagen e-Golf to achieve the electric equivalent of a city fuel efficiency rating of 53.5 L/100km and a doubled estimated range to 201 km from U.S. regulators, whose ratings also apply in Canada. 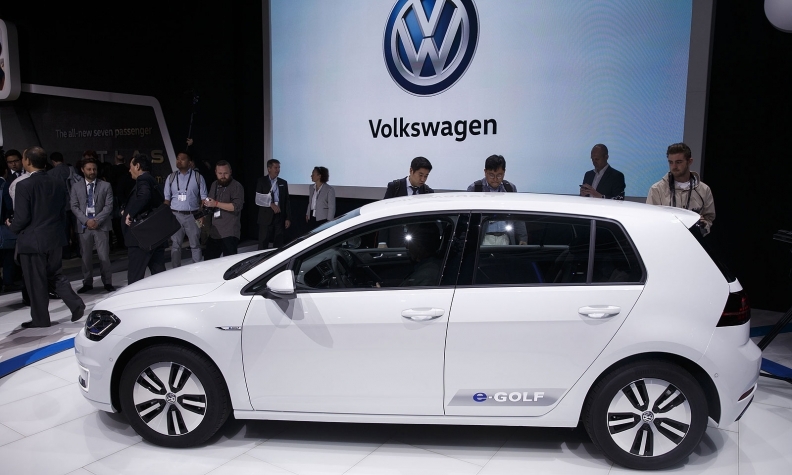 Overall, the U.S. Environmental Protection Agency rated the battery-electric 2017 e-Golf at the electric equivalent of 53.5 L/100km city/47.2 L/100km highway/50.6 L/100km combined, the automaker said Wednesday. The agency also rated the compact’s range at 201 km. The 2017 e-Golf, which Volkswagen Canada said goes on sale this spring, features an upgraded 35.8 kWh battery pack and a new 100 kWh electric motor, capable of producing 134 hp. Both are marked improvements over the previous e-Golf, which featured a 24.2 kWh battery and 85 kWh motor producing 115 hp, with an estimated range of 133 km. The EPA rated the previous e-Golf at 53.5 city/44.6 hwy/49.3 combined L/100km electric equivalent. Pricing for the 2017 e-Golf has not yet been announced. When it arrives, a 7.2 kW on-board charger will be standard on both SE and SEL Premium trims, giving the compact a charging time of under six hours with a 240-volt charging station. With DC fast-charging, which comes standard on the higher trim, the battery can be charged to 80 per cent within an hour, VW says.